Use forms to gather important information about your visitors and contacts. 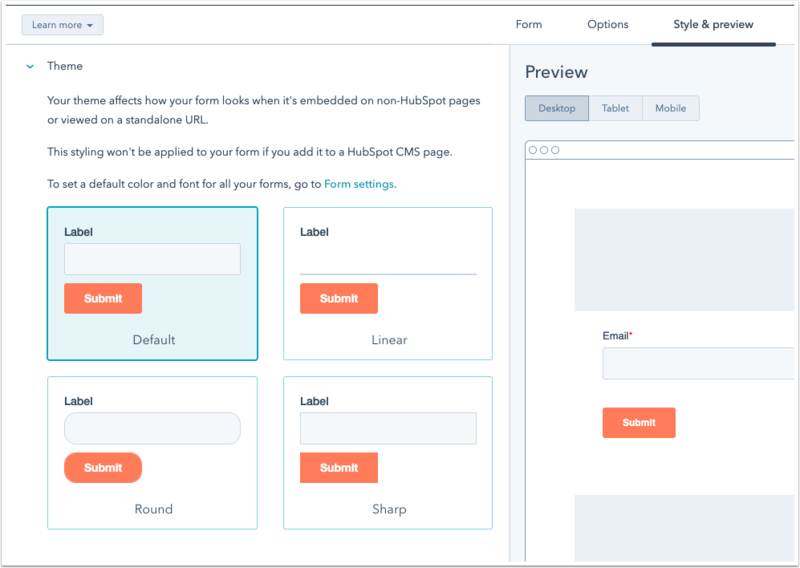 In HubSpot, you can easily create forms to add to your HubSpot pages or external site. In the left panel, select Regular form. In the left panel, select Blank template to start with a blank form, or a pre-made template to start with a form with fields for a specific use case. The form preview for a selected template will appear in the right panel. In the upper right, click Start. At the top of the form editor, click the pencil icon edit to edit the form name. In the left panel, use the search bar to search for a field, or browse through your property groups. To create a new contact property and use it as a field on your form, click Create new next to the search bar. Drag and drop fields onto the form preview on the right to include them on your form. Fields can be placed above, below, or next to other fields. Please note: by default, the Email field is required for form submissions to create contacts. Learn more about allowing form submissions without email addresses to create contacts. To edit a field's display options, click the field in the form preview on the right. Label: the name of the field that will appear on the live form. Help text: informational text below the field's label to help the visitor complete the field. Placeholder text: text that appears in the input box for the field. The text will disappear when the visitor enters a value in the field, and will not come through in the submission, even if the field is left empty. Default value: a value that will be submitted for the field by default unless changed by the visitor. Progressive field options: select the action to take if the field has been previously submitted. Learn more about progressive profiling in forms. Make this field required: when the checkbox is selected, the field must be completed to submit the form. Make this field hidden: when the checkbox is selected, the field will not appear on the form, but can be used to pass values to contact properties for all submissions. You can also add rich text areas between form fields to add customizable text, create headers, or add spacing to your form. At the top, click the Options tab. What should happen after a visitor submits this form: choose to display a thank you message to your visitors or redirect them to another page after they submit the form. Please note: this sets the action for forms embedded on non-HubSpot pages or shared as standalone pages only; it will not set or change the action for forms added to HubSpot pages. Follow-up options: select the Send submission email notifications to the contact's owner checkbox to automatically send a notification to the contact's owner. Send submission email notifications to: click the dropdown menu to select the default teams or individuals to send submission email notifications to, regardless of contact ownership. Recipients set here will be overwritten by recipients set in the form options on HubSpot pages. Form and error message language: select the language for default field labels and errors displayed to visitors who don't fill out the form correctly. Cookie tracking: HubSpot recognizes and tracks your contacts based on the cookies that are dropped in their browsers. In some situations, you may have multiple contacts filling out the same form on the same device (e.g., at trade shows). In these cases, you can disable cookie tracking so that each submission creates a new contact. Cookie tracking is enabled by default. To disable it, click to toggle the Cookie tracking switch off. Please note: disabling cookie tracking will prevent analytics data from being recorded as part of the original contact submission. This option is designed for offline forms only. If a contact later reconverts organically with the same email address on a form with cookie tracking enabled, their cookie will be stored and historical analytics will be captured on their contact record. To allow visitors to remove any pre-populated fields on the form and create a new contact on submission, select the Add link for users to reset the form checkbox. When this option is selected, visitors who see form fields pre-populated with their own or someone else's information can click a Not you? Click here to reset link that resets the form. This will also disable cookie tracking in the form submission, which prevents any cookie overwrites. Pre-populate fields with known values: if a contact has previously visited your site and submitted a form, and HubSpot was able to store and track their cookies, any known field values can be pre-populated on the form. With this option enabled, visitors can save time filling out subsequent forms on your site. This option is enabled by default. To disable this option, click to toggle the Pre-populate fields with known values switch off. At the top, click the Style & Preview tab to style, preview, and test the form. In the left panel, click the Style tab. Select one of four available themes. The form preview will update in the right panel. To change your form's colors and fonts, click Form settings. Learn more about customizing your global style settings for forms. In the left panel, click the Preview tab. Under Device types, select desktop, tablet, or mobile to view the form as it will appear on different devices. If you have progressive profiling enabled on the form, you can test the form to see how it changes for a visitor who has already filled in a progressive field or already has a value for the field. Learn more about testing progressive profiling. If you have dependent fields on the form, you can test the form by entering the value(s) that meet the criteria set up for the dependent field in the field it is dependent on. Learn more about testing dependent fields. In the top right, click Publish to take your form live and make it available for use on HubSpot pages. You can also embed your form on an external website or share it as a standalone page.